The site of Briançon has been a strategic location since ancient times given that it is located at the crossroads of various valleys of Savoy (annexed to France only since 1860) and France, not far from Italy. 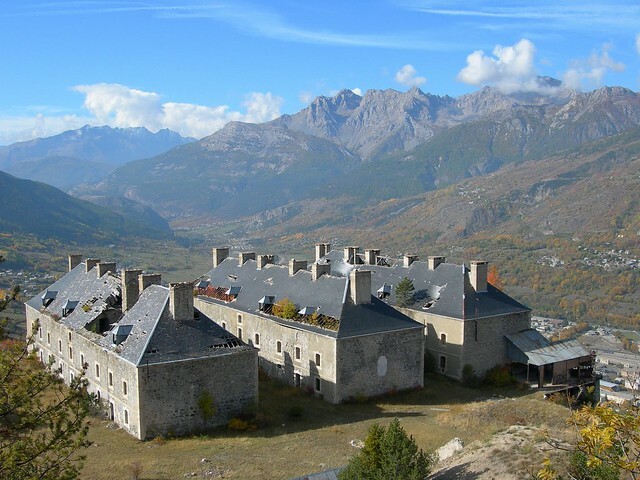 During the 17th century, the renowned military engineer Vauban, was chosen to adapt his defense concepts and his experience to design elevated fortifications in this complex site of mountains. In order to complete this outstanding work, more fortresses were subsequently built. Today, a combination of natural elements and human interventions are threatening this unique site. – The degradation of the rocky foundation and the frost striking at 1600 meter of altitude put a great strain on these constructions. – In addition to the devastating effects of the frost, one must mention those of lime. This natural fertilising agent that is used as a mortar, facilitates the development of roots which obstruct drainage pipes, penetrates walls and breaks the masonry. – The lack of maintenance since the Second World War has accelerated the degradation of these gorgeous fortifications. UNESCO recognised the importance of the Vauban’s fortifications and in 2008 classified them as a World Heritage Site. For its part, the municipality has developed an active policy concerning the restoration and promotion of its heritage since 1984. Moreover, a local association (CVM) is working to restore and revitilise the site in cooperation with the city. The neighbouring regions are also committed to participate in the effort to restore the site, as much as the Ministry of Culture over the period 2012-2014. The nomination for ‘The 7 Most Endangered’ was made by Europa Nostra France, which highlighted the historical, artistic and cultural importance of the fortifications of Briançon as well as its fabulous tourism potential.